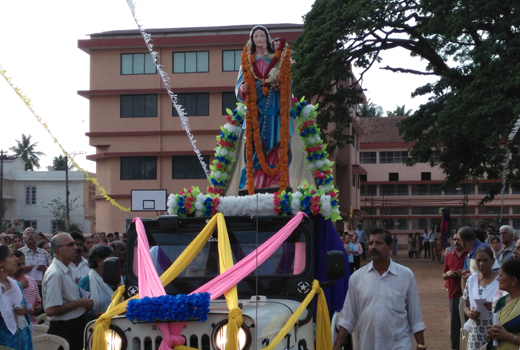 Mangaluru, May 02 2018: May day was marked in a special way by thousands of indigenous Catholics of Mangaluru. A unique evening of ’March with the Rosary’ a meditation and procession from Milagres Church to Rosario cathedral on May 1, Tuesday. 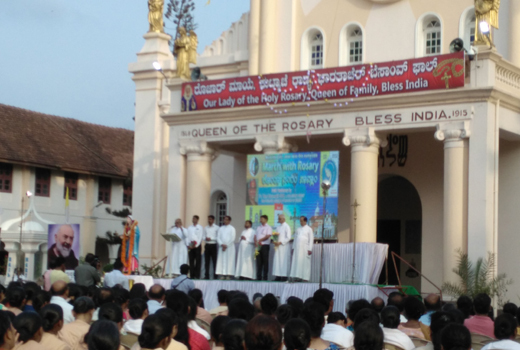 It was part of the 450 years of the church in Mangalore and commemorating the year of the rosary 2018 being observed. The crowning glory was the presence and sharing of the soul shattering experience of Rev. Tom Uzhunnalil, a priest of Kerala origin serving in Bangalore, who was deputed to Yemen in 2015, His story of abduction by ISIS terrorists in Aden in March 2016 and who was released in September 2017, after the intervention of the Pope, Sultan of Oman and Indian Govt. 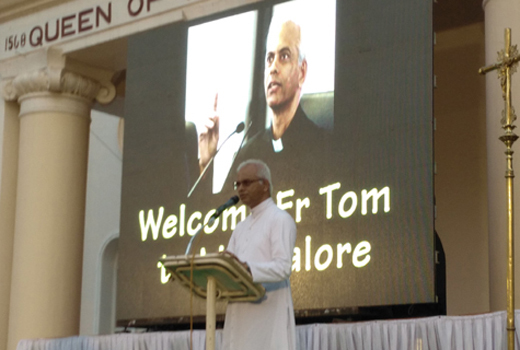 Fr.Tom’s shared story is given below in brief. 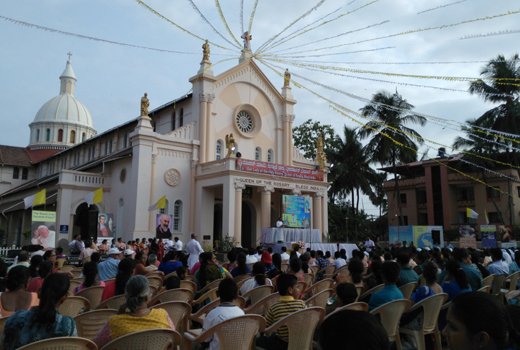 The efforts of the key people of the Mangalore Diocese was very visible and according to the ICYM statement there were several leaders behind the effort, it was the brain child of Rev.J B Crasta, Rector of the Rosario Cathedral. 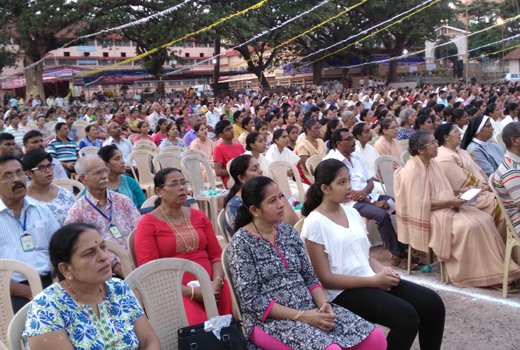 Rosaries were distributed to all those who needed them and was a grand success. The procession with rosary meditation from Milagres to Rosario Cathedral took an hour with hundreds of participants young and old. Well known preacher Rev. Boniface Pinto in his erudite homily gave some very inspiring thoughts. 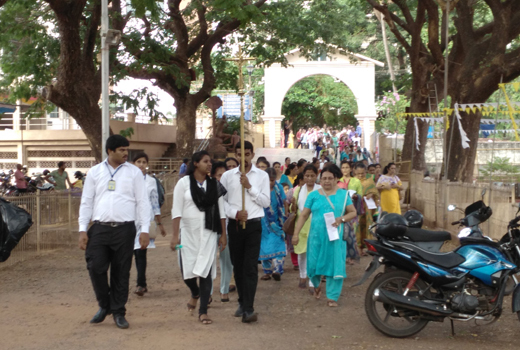 The Rosary to the Konkani Catholics was everything in ancient times, church rituals were in Latin, they could not read the scriptures. When Tipu held them captive from 1784 to 1799 in Srirangapatna, the rosary was their only means of support and communication with their God. Rosaries were all confiscated, yet they innovated to make rosaries from all kinds of materials available...even the long tresses of women were cut and knotted with twigs to form rosaries. In life people today hold on to money, gold, mobiles, keys and such material objects...but when dead the Catholics hands are entwined with a rosary to go to eternity. It was stressed that today the rosary is the tool to hold families and stability for people in the fast paced life. He mentioned that Pope Francis amidst his packed schedule still recites all 20 mysteries of the rosary each and every day. 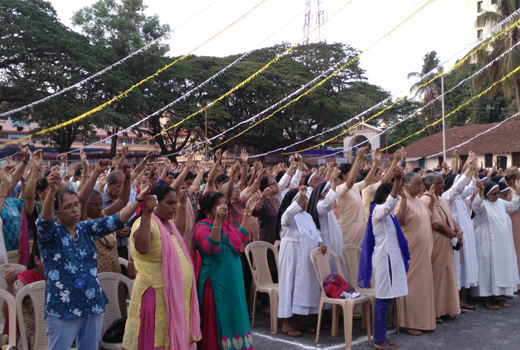 Rosario grounds witnessed an animated version of the ’Rosary Mediation’ with Rev. Richard D’Souza, Director of Canara Communications presenting the Sorrowful mysteries in a heart touching articulate manner on screen and most had their arms lifted in supplication. ICYM leaders and members, Rev. Johnson Sequiera, and many others were in the fore frount of making the celebration a big success. With enthusiastic participation. While narrating some facts Rev Tom said he was visiting places specially to thank people who prayed and grieved for his plight, he said " It is your concern and prayers that saved me and God was moved by the prayers and efforts and I am always grateful. People of Mangalore too I am aware prayed and were much concerned for me". He mentioned that he came to know of many facts only after his release. for example he did not know that the fifth nun hid and miraculously escaped from the abductors. he mentioned that he never felt any serious dpression, mental breakdown, fear or any such negative things after his release and his health is improving and the love shown by all people really moves him. 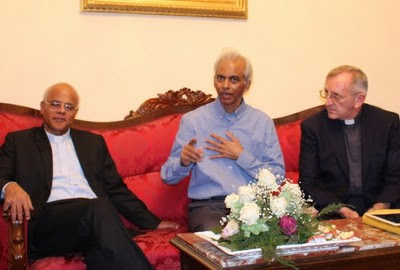 Rev Tom Uzhunnalil was kidnapped during an attack on the missionary compound by gunmen in Yemen, killing sixteen people, including four nuns belonging to the Missionaries of Charity, the order of founded by Mother Teresa. He met with Pope Francis. According to L’Osservatore Romano, the Vatican newspaper, the priest kissed both the pope’s hands and the ground at his feet when he greeted the pontiff. Francis hugged the priest, and told his that he was praying for him during his captivity. He recalled how he was kidnapped from the chapel of the community of the Missionaries of Charity of Aden. He said he was “not mistreated and that as a result of his rapid slimming the kidnappers also began to provide him” with the diabetes medicines he needed. Practically throughout the period he had the same clothes. The kidnappers, who spoke Arabic, communicated with a bit of English with him. He was moved two or three times but always blindfolded in such circumstances. 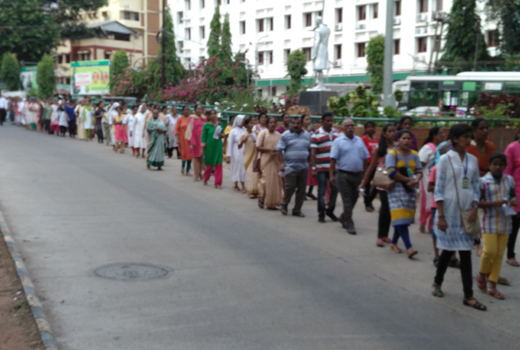 The people of Mangalore were very warmly honoured him all over the city.